Eight months after last hearing from the Opportunity rover, NASA officials announced the end of the craft’s 15-year mission Wednesday, closing out an ambitious chapter of Mars exploration that proved the Red Planet once harbored running water and demonstrated the promise of mobile robotic scouts to survey other worlds. The rover succumbed to a sky-darkening global dust storm, and last communicated to Earth on June 10, 2018. Mission officials hoped to regain contact with Opportunity after the dust storm cleared, but daily listening sessions and more than 1,000 tries to send commands to the rover produced no results. Thomas Zurbuchen, head of NASA’s science mission directorate, declared the end of Opportunity’s mission in a press conference Wednesday at the Jet Propulsion Laboratory in Pasadena, California. Opportunity landed on Mars on Jan. 24, 2004, to begin a mission that was not planned to last more than 90 days. Instead, Opportunity returned data for more than 14 years — nearly 60 times longer than its designed lifetime — and logged more than 28 miles (45 kilometers) on its odometer, farther than any other robot has driven on another world. “I have to tell you, this is an emotional time,” Zurbuchen said. Opportunity and its twin rover, Spirit, launched in 2003 from Cape Canaveral aboard a pair of Delta 2 rockets. After reaching the Red Planet in January 2004, both of the 384-pound (174-kilogram) rovers — each about the size of a golf cart — set out to explore their surroundings, climbing hills and descending into craters in search of geologic clues about the ancient history of Mars. 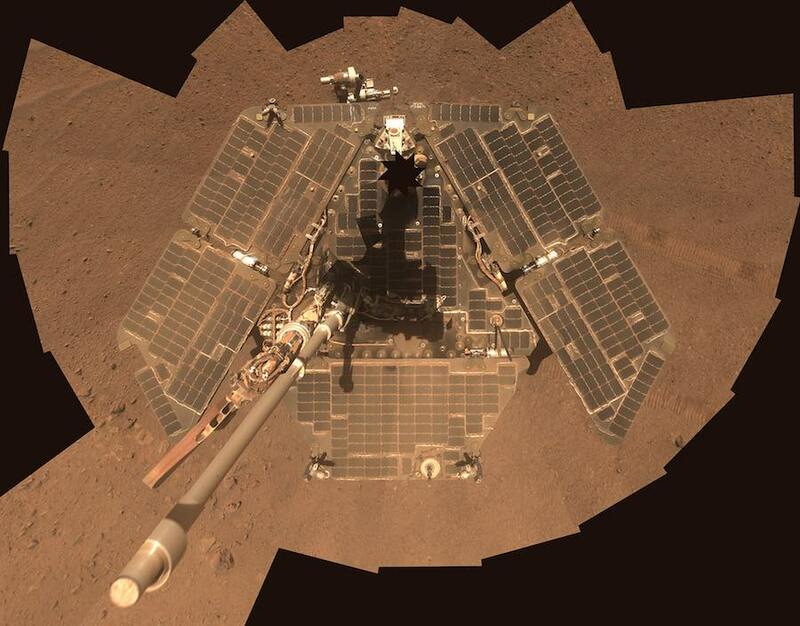 Spirit ended its mission in March 2010, after getting stuck in sand with its solar panels in an unfavorable orientation to generate power during a harsh Martian winter. Skies over the Opportunity rover blackened last June as a global dust storm enveloped Mars and starved the robot’s solar panels of sunlight. It was the most extreme dust storm observed by Spirit or Opportunity since their landings in 2004. Ground controllers regularly listened for a call from Opportunity after losing communications with the rover, using giant dish antennas from NASA’s Deep Space Network to try and detect a signal. Engineers hoped the rover would automatically wake up and radio Earth when the dust storm cleared, but that did not happen. Managers then prepared commands to send up to Opportunity “in the blind,” hoping that a gust of wind would clear the solar panels of dust and bring the robot back to life. Opportunity’s ground team sent up the last such command Tuesday night. 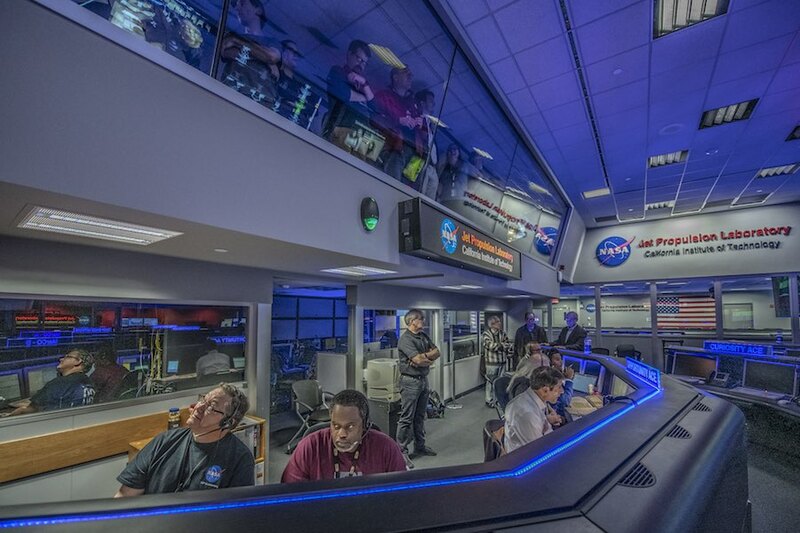 After the signal took 13-and-a-half minutes to reach Mars — traveling at the speed of light — Opportunity should have sent a response back to engineers keeping vigil in a control room at JPL. Silence reigned. NASA spent around $800 million — in 2003 economic conditions — to build and launch the Spirit and Opportunity rovers. 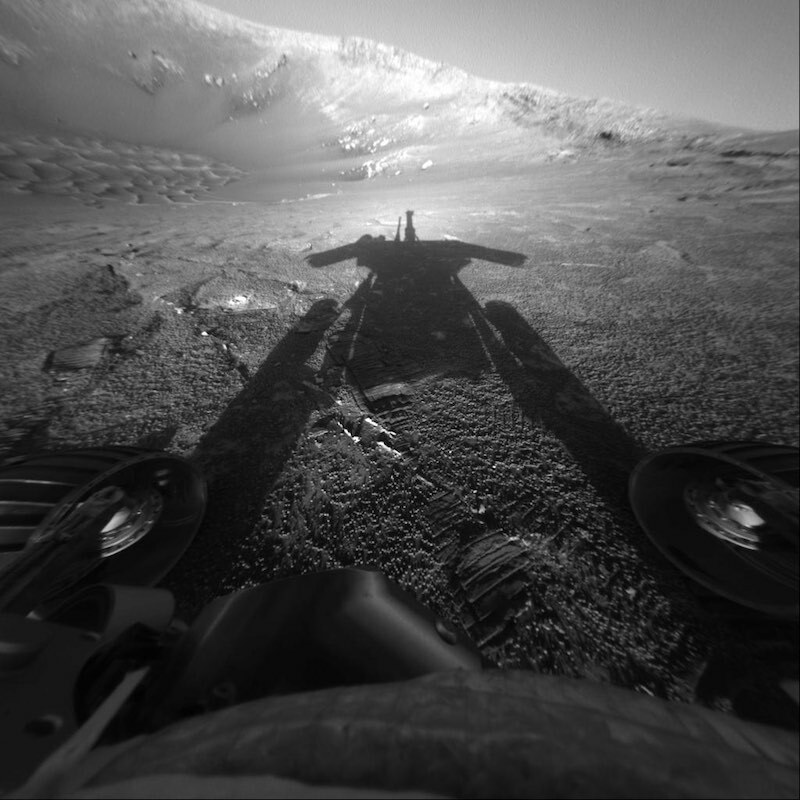 Opportunity’s panoramic camera captured this self-portrait on Mars in 2014. Credit: NASA/JPL-Caltech/Cornell Univ./Arizona State Univ. After a six-month journey from launch, Opportunity dropped to an airbag-cushioned landing at Meridiani Planum, a smooth equatorial plain, and rolled into a 72-foot-wide (22-meter) crater, a fortuitous interplanetary “hole-in-one” that presented scientists with a treasure trove of layered bedrock exposed by an ancient asteroid impact. “The first day that we landed, it was geologic pay dirt right from the very beginning,” Squyres said. Within weeks, Opportunity discovered evidence that liquid water once flowed across the Martian surface at the Eagle Crater site. Opportunity drove to two bigger nearby craters — Endurance and Victoria — for an extended mission, then Squyres and his deputies decided to dispatch the rover across a barren stretch of Meridiani Planum, riddled with sand dunes, toward 14-mile-wide (22-kilometer) Endeavour Crater. The cross-country trip took three years. 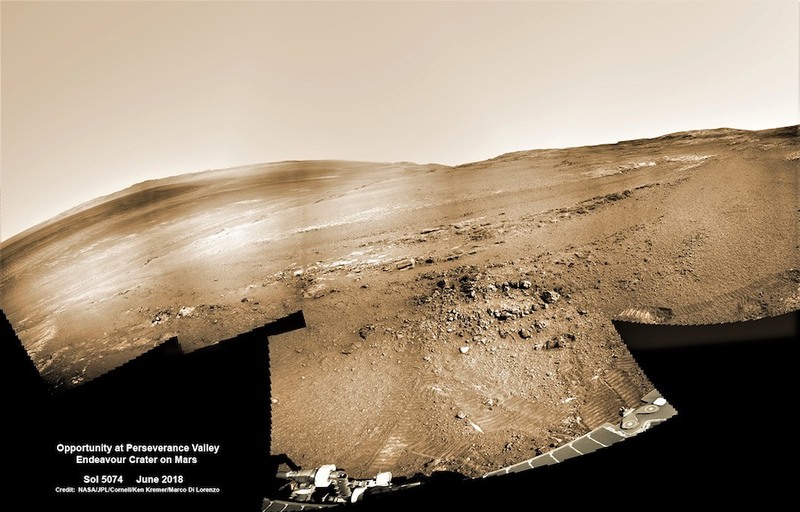 Opportunity took 217,594 raw images on Mars, nearly double the number captured by Spirit. Abigail Fraeman, Opportunity’s deputy project scientist, was a junior in high school when the rover returned the first set of images soon after landing in Eagle Crater. She was at JPL for the landing, thanks to an educational project provided by the Planetary Society. “It was those first images from Opportunity that inspired me to become a planetary scientist,” she said. “They revealed a view of Mars that we had never seen before. Callas counted the intergenerational team as “one of the most rewarding legacies” of the Spirit and Opportunity rovers. Scientists and engineers brought up with the Mars rovers will go on to support future space missions, such as the Curiosity rover still exploring Mars, or the Mars 2020 mission set for departure to the Red Planet next year, he said. “We built them for Mars. That’s the place where they were designed to go. That’s their home, that’s where I would like them to stay. Also, if you had the opportunity to bring 180 kilograms of stuff back from the surface of Mars, the last thing I want to bring is something I know exactly what it’s made of,” joked Steve Squyres, Mars Exploration Rover principal investigator from Cornell University, in response to a question about retrieving the rovers and returning them to Earth. “Why did these rovers last so long? Why did Opportunity last so long? There are two main technical reasons,” Callas said. “One is that we had expected that dust falling out of the air would accumulate on the solar arrays and eventually choke off power after about 90 days. But what we didn’t expect that wind would come along periodically and blow the dust off the arrays. This on a seasonal cycle actually became pretty reliable, and allowed us to survive not just the first winter, but all the winters we experienced on Mars, and to keep going and exploring. 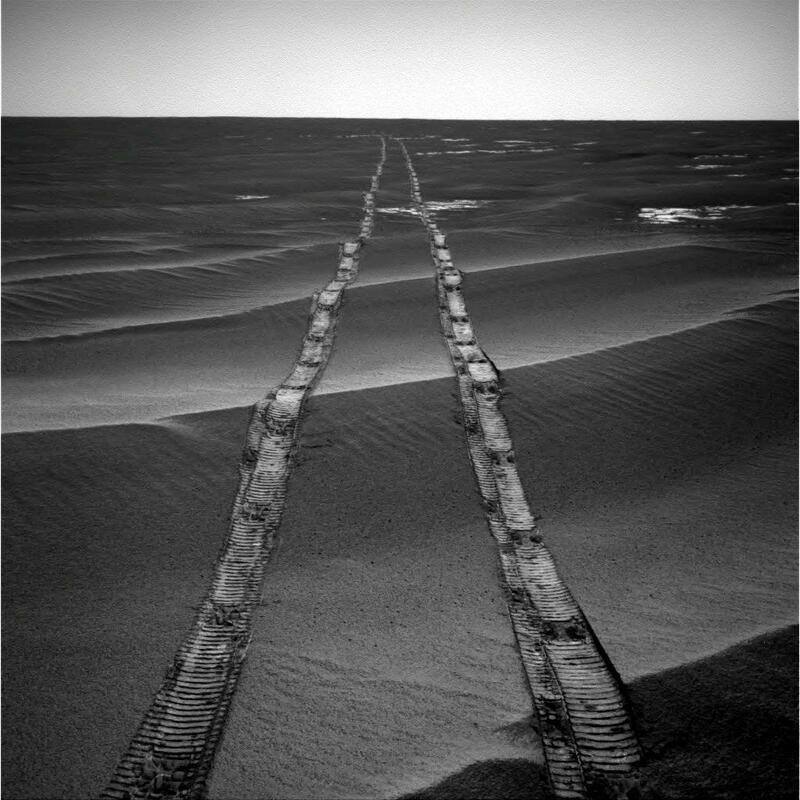 Opportunity suffered from a type of amnesia. A flaw in the rover’s flash memory forced ground controllers to retrieve imagery, science data and housekeeping telemetry before Opportunity went into hibernation every night, then start fresh again the next morning. “We had many challenges along the way,” Callas said. “When we first landed on Mars, one of the things that happened was we had a heater on the robotic arm on the rover that got stuck on. So every night that heater would come on and waste energy from the rover. If we left it alone like that, the mission wouldn’t have lasted long beyond the 90 days. “So we developed this technique called deep sleep, which is every night we would turn everything off on the rover, including all the survival heaters, and the rover would get cold, but it would stay just warm enough that in the morning when the sun would come up, we would power everything back up,” he said. “It never got below its allowable temperatures. “This is kind of like if you have a light in your bedroom stuck on, and you can’t sleep, so what you do is you go outside and you turn off the master breaker for your house,” Callas said. “But that means your refrigerator starts to warm up, but by the morning time when you wake up and you turn the breaker back on, the ice cream hasn’t melted too badly. And you do that every single night. Now imagine doing that for 5,000 nights. That’s what we had to do for this vehicle. But it also, partially perhaps, explains why we weren’t able to recover the rover. If the rover’s batteries were fully depleted, its internal clock would have reset.